Quick tour of a working museum piece. Late 70s technology, contemporary of the Fluke 8020A. Update: Ran across this bit of Weston history. Can’t vouch for the factual correctness, but it is interesting nonetheless. It looks like they took the Fluke case and flipped it upside down. I have never heard of that brand before, where did you run across this meter, if I may ask? I spotted it on eBay, won it for $0.99 + shipping. It caught my eye because I had seen it mentioned in a February 1980 Popular Electronics electronics article about the first generation of handheld DMMs. They were a player at the time. 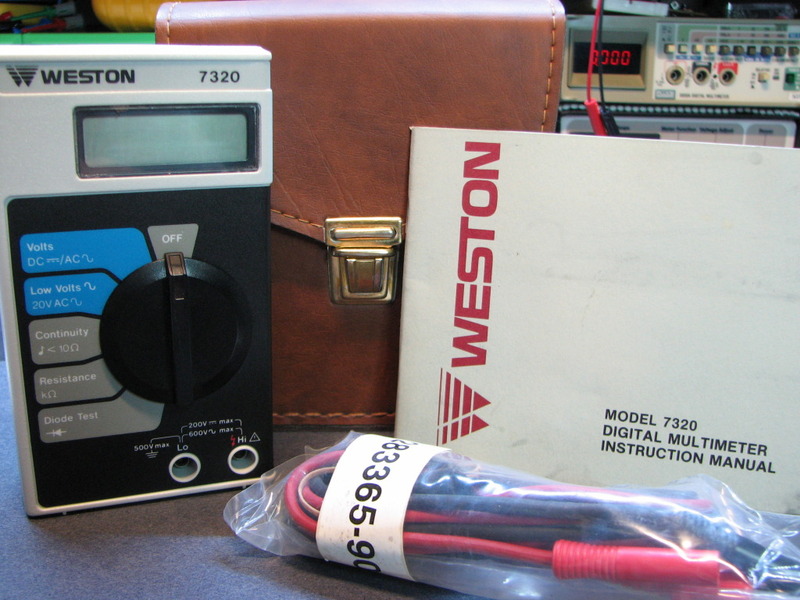 Weston Instruments is a very old company dating from the 1800s. Search “Weston meter” on eBay and you’ll find all manner of vintage measuring devices. I don’t know the details of their more recent history or what exactly happened to the company through mergers and buyouts. Google shows me references to “Sangamo Weston” and also a connection Schlumberger. I also have a really “cute” Weston 7320 DMM outfit that I have neglected to photo-document. Another $0.99 + shipping deal, complete with leather case, manual, and original leads still sealed in their plastic bag. I forgot to comment on the PCB. The old saying they don’t “make’em” like this anymore definitely applies here. I sure am glad there is now open source and free PCB software as the methods they had to use back then would be a major pain. I have to say that PCB just fascinates me. I still have one in working order. I used it when I was a tech for Wang Labs in the 80’s. Just use it around the house. Found this forum, because I am shopping for it’s 3rd set of probes. bought my roadrunner in 1979 when i was working for sharp electronics–got my audible continuity beeper hooked back up tonight – if this meter could talk !! Same meter was bought in UK. 1982 for University Lab, then purchased by me on retirement. Used continuously to date, and still in full working order. Differences from your images: in image (1) instead of “Roadrunner” mine has “6100”, and in image (2) mine is numbered “A 025366”. Powered by an RS22 NiCd re-chargeable, used since 1993. If not overcharged, which evaporates water from the electrolyte, NiCd retains charge longer than NiMH, and also has a longer service life. Felicitaciones. Tengo un multimetro fluke 8020 B idéntico al l weston 6100.